At age 23, Jesse Jantzen already has an impressive wrestling resume. First four-time New York high school state champion. 2004 NCAA Division I champ at 149 pounds. Three-time NCAA All-American. Three-time EIWA conference champ. One of eight wrestlers in his weight class selected to compete in the inaugural season of Real Pro Wrestling. Subject of a four-page spread in Exercise and Health magazine. Gold medalist at the 2005 World University Games. Jesse Jantzen is focused on his goal of representing the U.S. at the 2008 Olympic Games in Beijing. But that's all in the past. Despite these incredible accomplishments, Jesse Jantzen is not looking back. When asked about previous achievements and honors, Jantzen is rather modest -- and almost reluctant -- to discuss them. Instead, he's looking forward to the next freestyle event, and the next, and the next … all with the idea of gaining experience to prepare for his ultimate goal of wrestling in the 2008 Olympics in Beijing. In fact, at the time of the interview, Jantzen was getting ready to travel to Budapest, Hungary for the 2005 World Wrestling Championships. Not to compete, but, according to Jantzen, to "support the U.S. team." Jantzen adds, "I want to observe the wrestlers from other countries in my weight class, and learn by seeing them in action in person. It's also helpful for me to travel overseas, and gain additional firsthand experience in the differences in food, accommodations, training facilities and officiating so that these won't be as much of a factor for me in international competition." Jantzen is fairly new to the international freestyle wrestling scene, having graduated from Harvard University in 2004. In a little more than a year, the 66kg/145 lb Jantzen was crowned champion of the Henri Deglane International … was runner-up at the NYAC (New York Athletic Club) Open … placed third at the Dave Schultz Memorial … sixth at the U.S. Nationals … and fourth at the 2005 World Team Trials, the event that determined who would take to the mats for the U.S. at the Worlds in Hungary. Jantzen did not lose a single period in the entire event, and shut out his opponents in seven out of ten periods. "I didn't know any of these guys, being kind of new to international (competition)," Jantzen said in a published interview after winning the gold. "Sometimes I think that is good for your wrestling style. Fortunately, I just had those two periods each time, which definitely helps in this environment and with only 15 minutes between matches." When asked about the World University Games for this profile, Jantzen said, "This year, there was a University Team Trials qualifying event in Colorado Springs in the spring of 2005. I think that resulted in having one of our stronger teams ever at the Games." Jesse Jantzen was born and raised on Long Island, a long-time hotbed for amateur wrestling. "My dad was a wrestler, and introduced me to the sport when I was five or six years old," said Jantzen. "When I was in grade school, I also played soccer and baseball, but, by ninth grade, I decided to concentrate on wrestling." While competing at Shoreham Wading River High School, Jantzen built an impressive 221-3 record … with those three losses coming in seventh and eighth grade. In the state of New York, qualifying seventh and eighth graders are allowed to compete at the state wrestling tournament. Jantzen took advantage of this rule, and placed third both years. "It provided me with good experience in competing at that kind of event," according to Jantzen. In fact, that experience served Jantzen well in subsequent trips to the state tournament. Jesse Jantzen competed for the New York Outrage in the inaugural season of Real Pro Wrestling. He became the first wrestler to win the New York high school championship four times (1997-2000). Adding to the luster of Jantzen's accomplishment: Unlike most states with wrestling championships conducted in multiple divisions based on school enrollment, New York had only one state champ in each weight class at the time Jantzen claimed his titles. And, making it all sweeter was the fact that Jesse was coached by his father Don, who was head wrestling coach at Shoreham Wading River. When asked if there was pressure to achieve an unprecedented fourth state championship, Jantzen said, "Yes, but most of it was self-imposed. Overall, it was a pretty exciting year, but it was a relief to win the title senior year." And, as if four state titles weren't enough, Jantzen accomplished even more as a wrestler while still in high school. He was a three-time All-American and two-time national champ … was named ASICS Wrestler of the Year … and National Most Outstanding Wrestler in 2000. With all these achievements as a high school wrestler, it's no surprise that Jantzen was heavily recruited. However, Jantzen's dream was to attend Harvard University. "A friend of mine, Andrew McNerney, is a volunteer coach at Harvard," said Jantzen, referring to the 1983 Harvard grad who earned NCAA All-American honors that year. "I was immediately impressed with the coaches, and how Harvard brought together the best of both worlds in terms of athletics and academics." "Early in my coaching career at Harvard, one of our alums told me about this eighth grader in New York," said Jay Weiss, head wrestling coach for the Crimson. "Through this alum, Andrew McNerney, I met Jesse during his high school career. I told him that we could help him become a national champion." In 2004, Jesse Jantzen defeated Zack Esposito to claim the NCAA title at 149 pounds. That NCAA title came in Jantzen's senior year, a capstone to a great career at Harvard. Even as a freshman, Jantzen accomplished great things. He posted a 17-7 record, placed second at the EIWA championships, and was an NCAA qualifier. His achievements were recognized by others, being named Ivy League Rookie of the Year, and first team All-Ivy … and selected to the 2001 All-Rookie team by Amateur Wrestling News. And, as a portent of things to come, Jantzen was named Most Promising Freshman, and earned his team's Hardest Worker Award. "I've never had a more dedicated wrestler than Jesse," said Weiss. "His work ethic is incredible. He's a quiet leader, one who inspires others in the wrestling room to work harder and do more on a daily basis. He's a prime example that hard work pays off." At the 2004 NCAA Tournament, Jesse Jantzen earned Most Outstanding Wrestler of the Tournament honors for his efforts. As a sophomore, Jantzen was crowned EIWA champion at 149 pounds, and was named the conference's Most Outstanding Wrestler. 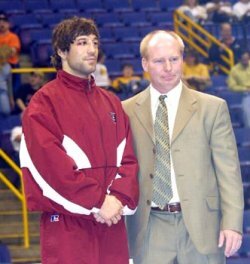 At the 2002 NCAAs, he placed third -- the best finish of a Harvard wrestler since 1953 -- and earned All-American honors. In his junior year, Jantzen claimed his second EIWA title, and again took third place at the NCAAs that year. He also earned Academic All-American honors in 2003 -- the only Harvard athlete to do so that year. Senior year was the pinnacle. Jantzen earned his third straight EIWA title, earning a trip to the 2004 NCAAs. In St. Louis, the top-seeded Crimson wrestler worked his way through the talent-rich 149-pound bracket to make it into the finals, where he achieved a 9-3 win over second-ranked Zack Esposito of Oklahoma State. For his performance at the NCAAs, Jantzen earned Outstanding Wrestler honors. When Jesse Jantzen won the NCAA title in 2004 -- he became the first Harvard wrestler to accomplish the feat since John Harksness won the title in 1938. Jesse Jantzen was the first NCAA champ from Harvard since John Harkness won the 175 pound title in 1938. Harkness was in the stands, cheering for Jantzen. "We made sure he would be there," said Weiss. "He was so thrilled to be a part of the event." In addition to his freestyle wrestling career, Jantzen was selected to compete in the first season of RealProWrestling, shown on Fox Sports and PAX-TV in the spring of 2005. One of eight competitors in the 66kg/145 lb weight class, Jesse wrestled for the New York Outrage team. "I'm glad to have been a part of it," said Jantzen. "I liked the rules that made it easy to score points, and encouraged action. I would do it again." Jesse Jantzen continues to focus on the future. A member of the New York Athletic Club freestyle team, Jantzen lives in Cambridge, Massachusetts and continues to work out in Harvard's wrestling room, providing guidance and inspiration to other wrestlers … and preparing himself for the long road towards the 2008 Olympics. "I try to go to every tournament, to gain more experience and learn by wrestling and observing." said Jantzen. "Jesse makes a strong impression on all he meets, whether through wrestling, or off the mat," according to Weiss. "He's inspiring on a daily basis."